I never soak my vegetables in brine overnight. The only time I did this, the piccalilli turned out extremely salty, even after rinsing the vegetables. The difference is that instead of crunchy vegetables, you'll just have a softer consistency, which I don't mind at all. 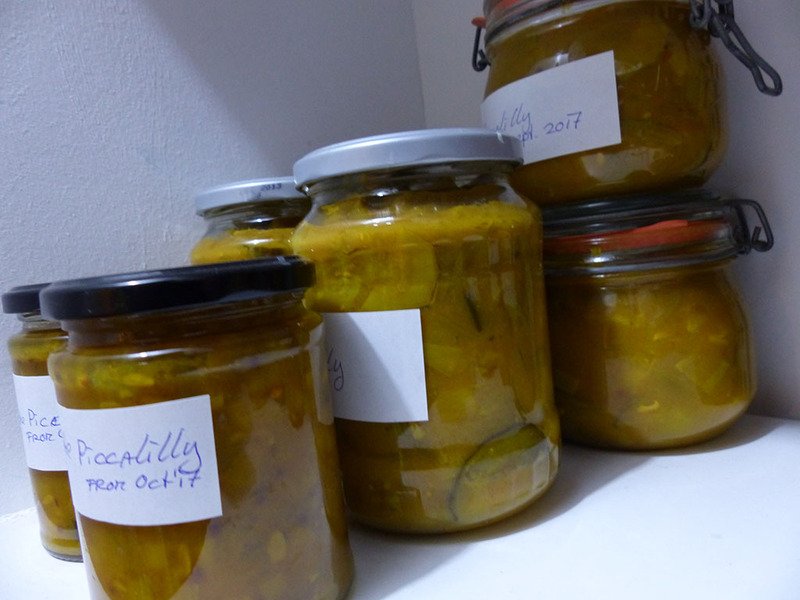 So, this is how I make piccalilli. Cut all the vegetables in fairly even sizes. Mix together the turmeric, mustard powder, cornflour and sugar. Add a little bit of the vinegar to make a smooth paste. Put the mixture in a large pan, add the rest of the vinegar and the vegetables and simmer for around 15 minutes. Add a little salt to taste. If the sauce is still too runny, you can simmer for a bit longer or make a bit more paste of cornflour and add this to the sauce. Add to sterilised jars and screw the lid on while it's still hot. This way you will hear a gentle 'plop' when the jar creates a vacuum and you know this jar will keep for months and months. Leave it for at least a month for the flavours to develop. You can be adventurous with this dish, add more sugar if you like it sweeter, if it's too thick add a bit more vinegar etc etc. You can add curry powder or ground ginger, the flavours are endless! I make mine in August to use up all the excess vegetables and eat it from October. Pickled vegetables used to be about the only vegetables to eat in February and March and there is nothing wrong with that in my opinion!